Should tablets have a keyboard? – That’s a burning question in the tablet world. Not actually as the burning question in the tablet world is, would there be a worthy opponent for iPad ever. But keyboards for tablets is doing the rounds too. Steve Jobs, made tablets (read iPad) a tremendous success by simply taking away the keyboard from the laptop and giving a new input method through the touch screen. Looks like some folks (including Apple) are trying hard to undo Steve Jobs hard work. 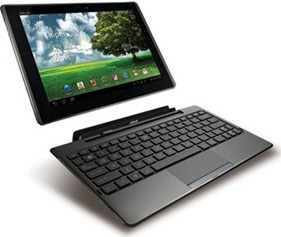 Asus has launched its Transformer tablet which comes with its own keyboard dock and keyboard. I like the idea of Transformer. What Asus has done with Transformer is it eliminated the need of any additional tablet accessories, much to the chagrin of Logitech. As for Logitech it sells 3 tablet keyboards which Logitech sells, one for iPad, one for Samsung Galaxy Tab, and one for Android tablets. Apple is also guilty for this tablet bloat. It sells a wireless keyboard for iPad. If tablet is a mid-way device between a smartphone and a netbook, tablet with keyboard looks like a mid way device between a tablet and a netbook. Necessary or unnecessary segmentation? Reason for iPad’s success is its mobility. iPad was able to achieve the mobility by ditching the keyboard. When we add the paraphernalia of the wireless mouse, wireless keyboard and a USB dongle, the tablet is suddenly a netbook. Tablet isn’t as mobile as it should be. Bloating the tablet and accessorizing it is a very personal thing to do and there’s nothing wrong with that. Is it wise for massive keyboard users to go for a tablet and then buy all the bells and whistles? Should humanity get better at typing on the tablet? Are keyboards to tablets a learning mechanism for the mankind’s evolution to tablet typing? Isn’t a tablet with keyboard an anti-thesis of a tablet? Govt. paints rosy picture for Software, Services & Electronics Growth, but how realistic Is It? Interesting poll. Tablets were introduced as a keyboard free device and adding the keyboard has completely killed the concept. It’s become somewhat more like a mini netbook.